I have written a simple RiskSimulator for level stakes betting. The application permits up to 100,000 bets to be simulated with graphical outputs. The user enters fair and bookmaker/exchange odds, a Monte Carlo simulation handles the rest. When the simulation is complete the yield, risk of no profit and risk of ruin are output. Also, two charts are output; a time series progression for the bankroll and a histogram of variance. 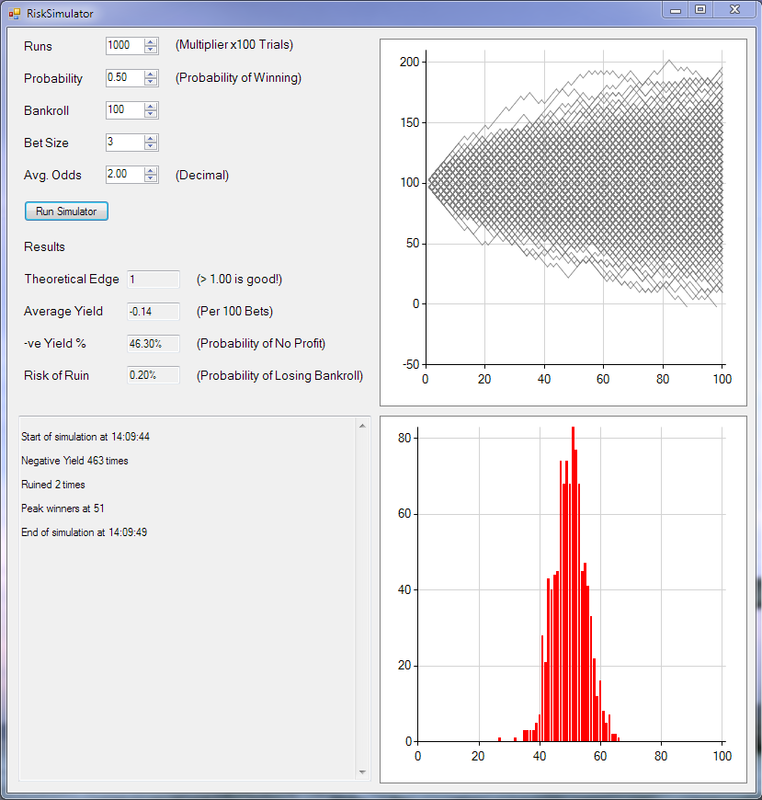 Although using standard statistical methods such as the binomial distribution will provide more accurate results, the simulator provides a more easy to understand visual representation. Also, a binomial distribution is based on an infinite number of trials. As nobody bets an infinite number of times a Monte Carlo simulation can show the user the wide variation between what is expected mathematically and what may happen in reality. Above, we see that the distribution of results in the histogram is not a smooth curve (as one would expect from a binomial distribution) even for 100,000 trials. Future work will include a StakingSimulator for users to investigate the worth of various staking systems, including level stakes, proportional stakes, Kelly Criterion and guaranteed losers such as Martingale and Fibonacci. Hello! I'm professional poker player from Argentina, and I'm interested to expand my horizons! I'm very thankful for your blog, and all the contribution that you give us, the beginners. I would like to ask you if you think that horse racing is the most profitable sports market, or if that depends of the knowledge that one could have in any particular sport? I'm catching up with your blog, and I don't know anything from horse racing, but I get along with football, tennis and basketball. Thank you very much for your help, and I feel sorry for my english! Regards! Hola Diego. Su Inglés es muy bueno. Football and tennis tend to be bet in-play and are quite efficient. There are many big syndicates that have covered most apsects of the games. Therefore, I would say that horse racing has been less covered by the big syndicates although they are beginning to concentrate on the sport. Unlike football and tennis horse racing offers chances to trade before the race begins as well as in-play. You can trade horse racing technically as in the financial markets without knowledge of the sport. You can also trade or bet with fundamental knowledge of equine abilities but that is not something that I do. I am sure there will be a niche that you can find and exploit. I would like to ask you, if you don't mind, about the liquidity of sports betting markets. As I was telling I'm a poker player, and is a business that is going to be less and less profitable. I'm looking for diversifying risks, that in "betting world", I think it never can be bad. I'm aware from the risk, the variance, and the lot of work that is needed in this world to be successful; also I know that nobody is going to give you anything. I know it depends on the efforts and abilities of each one, but I'm concerned to know about how long do you think it takes to make a profit, and if you could advise me about how much money you think I will need to start as bankroll? There is plenty of liquidity in sports betting markets, even for a poker bankroll. If you are in Argentina gamgling law may be different. Is sports betting legal? Can you get access to betting exchanges as well as bookmakers? Exchange betting will allow you to trade. If you are limited to bookmakers then you are more likely to be betting. If you understand variance then that will determine the % chance of losing a bankroll. By trading you can probably make a profit straight away but it will be in region of a couple of percent per amount traded. I don't bet, I just trade so I can't help you with betting. It all boils down to what you can achieve where you live. Your initial research will be to determine how you can bet/trade in Argentina. If you can get a proxy server then you might be able to bet on exchanges as though you were in the UK. If you can tell me if you are able to trade in Argentina then I can help you further. Online bet/trade in Argentina is unregulated, so I can do both. Recently I create an account at Betfair for playing poker, and I found the possibility of exchange betting, and I was interested immediately. Not because I am addicted to gambling or something, but because of the similarities with poker, I mean being able to not bet against the house; being able to have odds in favor. In poker you have micro-stakes for the beginners, so is not necessary have a big bankroll to start and learn, that's why I'm worried about the starting bankroll need it. I guess the minimum bet at betfair is $2, or something like that. If you have access to the Betfair exchange then all should be well for trading. You can trade with less than the $2 amount with 3rd party trading software. Then it is "just a matter" of learning to trade. Maybe you will find some help in that area on this website. Some of the books I review will also be helpful. Thanks a lot for your help James! Do you know if I subscribe at Smartsigger magazine, if I will be able to read all your publications, or I just will receive the next issue? I am pretty certain that you get access to the directory of back issues. They will tell you if I am correct or not. I have already sent an email to the magazine, and I'll catch up with the blog, I'm sure that I'll find a lot of interesting stuff! Thanks!